I've been working with double action and reversing candles as well as cleansing and protection around a particular situation for a few months. I've come across my first instance with a solid black (red interior) reversible and was hoping for some wisdom. After studying miss cat's "Hoodoo Candle Magic..." book as well as reading the forum etc., I see that when the wax arcs out to form angel wings that means someone or the situation is being protected by an angel. Personally, I work a lot with both Archangel Michael and my Guardian Angels; however, how do I know if I am the person being guarded or if the person whom I'm reversing the work back to is being guarded? That person is a skilled enough practitioner to know that the work is being sent back. That is a good question, but as i view it, the answer is somewhat encoded in the intention. If the wings had formed on a white candle dressed for blessing yourself, that would be a guardian for you. However, you are reversing to someone, not protecting from someone. The candle is directed at that person, not at you. Therefore, the wings represent the guardianship granted to the one whom you are attacking, not a guardian of yourself. Thanks, miss cat. How this person could possibly have anything other than demonic entities guarding them, let alone an angel, escapes my and a bevy of other people's comprehension, but that is another topic. Can anyone tell me what this means. I did a glass candle for Oshun and prayed. At the bottom of the candle the wick burned and fell off piece by piece it looks like bird droppings. The glass was clear though with no smoke. Hi let me start off by saying I don’t want someone on here to read any wax puddles for me I know there’s people on here to hire to do that.I did my come to me spell kit yesterday on my boyfriend and the free standing candle burned all over place with crazy looking wax shapes when it finished, then tonight I did my spell for a new guy the free standing candles burned down into beautiful puddle that’s never happened to me before.I I feel things are gonna really work this time , I’m going to get what I want and deserve someone that I can be happy with. What can you guys say if I burned a black glass enclosed candle(from LM) in addition to a Bend Over + Boss Fix candle to banish my target's resistance, but the black glass candle has black burned soot marks at the top? But clear at the bottom? I lighted a non-LM black candle this time but in the future, the black candle to banish resistance will be from LM. I know these signs on normal candles means multiple repeated spells are needed, but if it was a black candle for banishing resistance, does it mean that my target were initially fighting against the black candle but later submitted? No black soot marks at the Bend Over+Boss Fix, and the flames is dancing and a good size. The glitters for Bend Over all formed on the right side of the flame with one of the confetti star, only a little area was occupied. The glitter from Boss Fix all formed on the right side as a crescent moon with 5 confetti stars. All the herbs had sunk into the melted wax. There were glitter at the top of the candle but they were there when I first got the candle. So there are delays and obstacles and known causes before I get what I wished for? Also, I thought I was hearing things but I definitely heard a pop from the candles. A spirit trying to talk to me? The Bend Over candle initially had a very weak flame but it was steady, formed a couple knots but I removed them all with a scissor, putting out the flame in the process but I relighted, I never blew them out. The Boss Fix had a good flame going the entire time. Again, both candles now has a good dancing flame going, not too high, not too weak, the right size. Only my interpretation, looking for second opinions. These are what I saw so far, the candles haven't finished yet. I take what I said above back. After a bit research, my Bend Over and Boss Fix candles have guttering flames and alternating between high and low flame. But they were good burns and not weak flames. My non-LM black candle (a double wick scented candle) had two HUGE guttering flames causing black soot burn on top of the glass all around, now it is two slightly smaller flames but the bottom of the glass is clear. I know that there is no wind or draft at where my candle were placed. Looks like I might need a reading from AIRR when I have the time and money. I have a similar question to the one miss cat was kind enough to answer about solid black (red interior) reversing candles, except this is regarding the bi-colored double action. Unless I'm mistaken the top portion (black) is meant to send back harm that was sent to you, and the bottom half (red, green or white) is mean to bring back what was lost, denied or taken from you. So, if angel wings form on bottom (red, green or white) portion of the candle, does that mean you, rather than your enemy, is being protected or has a guardianship? Or am I missing something about the overall premise behind these candles? Thanks, JayDee. That was my initial thought, but I wanted to run it by y'all after seeing negative signs in a previous solid black reversing candle job. I love miss cat's book and Gamache's on candle magic, but neither goes into that much detail with reading the signs in these specific candles. Yes it is an art to learn and a lot depends on the candles burn, the wax, the oils and herbs and of course the petition and prayer. Understanding symbols left in was can be helped by using a tea reading book. I know omens can be seen as good or bad to give clues about how your work is going but can they be taken as a guide to help you to change your course or behaviour? I had an experience with some candles I did recently, which was clearly an omen. I burned two together for the same petition. Candle one was dressed with herbs, placed on a glass dish. Candle two had the petition carved into it and was just dressed with oils. Candle one burned with a tall flame but very quickly, ending up just a pool of wax with a flame and no wick remaining, at which point the glass cracked and the flame was hard to extinguish. I was meditating at the time and was jolted out of it, the thoughts in my mind at that moment, clear as day and very strange. I knew it meant something and after bit of analysing, I think I know what. My candle was for love and if I'd followed the course that I probably would have as my petition came to fruition, I probably would have messed things up. I didn't see that before but this made me re-think. Interestingly the key was openness and that same message was one that one of your readers gave me recently. It was like a reminder to stick to what I was told. I allowed the second candle to carry on burning. It was only half way when this happened. It burned well, with a tall, smokeless flame and went out in a small puddle of wax, in a C shape. So my instincts tell me that although it was a bad sign; a bad sign could just mean I need to rethink my actions or behaviour. Is that right though or am I way off course? It sounds like your instinct is guiding you well. Breaking glass in a love spell is not a good sign, so if you interpret that result as an indication to rethink your direction, then go with that. You can always re-do a spell to see if you get the same result, or new information, so you have that option open to you as well. Thank you. I'm just waiting for some new supplied to arrive and then I will re-do it. I guess I just need to learn to trust my instincts with these things. Would it be okay to leave love spell remains near my targets house or near a restaurant we use to aleays go to ? Unfortunately burrying it in my yard or a plant is not an option. I was thinking of leaving it at the base of a tree near our favorite restaurant, nesr his home, or on a the side of road i know he will drive through. I have left your post here, however, because folks often use this thread to try to find that information, and ... there it is! I lit a pink figural female and a pink figural male for a moving candle spell, plus some Block Buster incense. At one point, the incense started blowing toward the male figural candle. There were no drafts in the room. When incense blows to one figural candle but not the other, it means that your wish is having an effect on the person who is represented by that candle. Be aware that you can also, if you wish, deliberately blow or hand-waft the incense smoke toward the candle -- because candle spells, especially moving candle spells, are active as well as passive. That is, we need not merely interpret signs and omens, we may influence the outcome of the work. 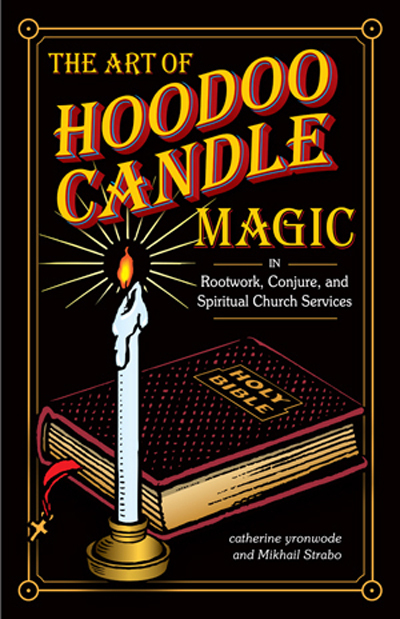 There is more about that in my book, "The Art of Hoodoo Candle Magic," and the book may be of interest to you, as it also describes other ways to influence candle burns. Thanks Catherine. What's heartbreaking is on monday, my target started a new relationship with someone else. But I understand spells take a least a month to manifest, and I could always do a breakup spell on them. Which in my case, will be justified. Spells do not need to take a month to work.This is something many people confuse with watching for movement and signs. A spell can be instant, it can be a few days, it can be a few months. As a worker, I want it soon not later. I work till I see it. After a few weeks if no movement and no signs I would read on the situation and see if its working, if not do something else, if it is kick it up a notch. JayDee is so right! I have been on the phone with a client, just DESCRIBING a return-to-me or come-back type spell i want my client to perform and the man calls my client WHILE WE ARE TALKING! That's about as instant as it gets! LOL! was the holder poorly made and the heat caused it. Or is it a sign, if so what is it telling me to do? I have moved your post to Candle Divination: Flame, Wick, Wax, Glass, Remains as it deals more with reading candles than cursing objects for people to touch. Without us knowing exactly what kind of cursing work you did it's a bit hard to determine what this means for your work. However there are a few pages that can help you determine this for yourself. I also highly suggest THE ART OF HOODOO CANDLE MAGIC which you can purchase right here in the forum, just a few posts above. Whoa. I am in a state of shock. A glass plate just exploded during the end of my candle working. It obviously got too hot, but I know everything is relevant in magic! This has never happened. A few days after I ordered the Lady Luck candle vigil at the church, I was inspired to set up an altar for Lady Luck (Fortuna). I went all out and now she is enjoying her little gifts. She has a glass of cabernet, chocolate, a handful of $2 bills, pyrite, 3 small lodestones dipped in magnetic sand (SO cute! ), and a small green candle I placed in a cauldron. She looks absolutely gorgeous! Every time I look at her altar I fall in love. Her altar sits right in front of my work station. So she is near me during every ritual. Today I decided to do some candle magic for abundance. I used a small glass plate (pretty sturdy), a green 6 inch freestanding candle loaded with herbs, tarot cards (thanks for the insert with my order!) and some incense. Earlier today I lit the Road Opener prepared vigil I purchased from LM, and I followed the instructions on the back. I also scrubbed down my apartment with gusto! I used Chinese Wash and Run Devil Run oil for the floors, then I walked over to the nearest crossroads with the bucket and dumped the dirty water. I even wiped down the front door (both sides) with vinegar, then with the Chinese Wash/Run Devil Run mix. I dabbed the five points on all windows and the front door (front and back) with Fiery Wall of Protection. It felt great! A couple of hours later I sat down to work the candle. Towards the end of the ritual the plate exploded! And one of the tarot cards has a burn mark - the number 10 in the ten of cups! I would love to learn more about this. Anyone ever have this experience? Also, it's not a good idea to use oils when washing your floors as they do not break down in water and can streak your floors or make them slippery. A tiny drop is OK but don't go overboard. You can dissolve bath crystals if you wish, but Chinese Wash on its own is a powerful spiritual cleanser. Thank you, Miss Athena! It definitely helps! I may have added a too much oil. LOL! The interesting part was during the candle burning I was was having a chat with a friend via FB messenger. She shared how she grew up on a farm in Mexico. On this farm there was treasure that the previous owner hid. He was actually killed by robbers when he didn’t reveal the location of the treasure. Many years later my friend and her family were living on this farm. A psychic visited the farm and astral traveled in front of the family while describing everything on the farm. He knew nothing about the treasure but he described the gold coins, gold chunks and jewelry in detail. It was in the well and in the tunnel below the farm. Long story short, her family started digging for the treasure and this man’s spirit retaliated. It was actually very dark the way she described it! Every time they started digging, it would get really dark and cold on the farm. She described it as a shadow of darkness and coldness hovering over the farm. While they were digging a spirit pushed her little cousin down to the floor and she broke her arm. At one point some of the animals died all of a sudden. There’s so much more! I felt like I was watching a horror movie when she was sharing the details. I wonder if this has anything to do with it? Around the same time I started practicing magic I booked a session with Mama E. This was my first and only session I’ve had with the LM family. The first card that she drew when I asked if I was crossed/cursed was the Magician card. She said I have all the tools to clear myself, and didn’t feel I needed to order any rootwork. This inspired me to go hard on reversing and uncrossing! The reading was actually very positive, so I’m wondering if yesterday was a sign of a major breakthrough. My finances have actually gotten much better since I started uncrossing and reversing...with a vengeance. I guess I won’t know until I book another reading! So many questions! Thank you, THANK YOU! I’m learning SO much from this forum. It’s a great novel I can’t put down! Is it possible this energy went to the wrong person? Because I'm seeing her name everywhere. What went wrong, and how can I fix it? WOW, what a story! I guess they never dug up the treasure after all, right? Yes, you really should get a reading on this as the events may or may not be connected. It's not possible to know on the forum, and we do not provide divination here. You'll need to re-connect with Mama E or another reputable reader. Good luck, please keep us posted. Hello All - I’m new to the forum and consider myself a newbie to the art. Very respectful of things and taking it slow. I have recently done a bottle with a petition for new friendships and reconciling old ones. Just a pure request to clear out any bad karma and start fresh. Genuine and sincere intent. I had a very curious thing happen and need help in the interpretation. I had a white taper candle in a glass holder on top of my bottle. The candle was almost out, burnt strong, clean and no tears. The candle had no oils, had just been cleansed as the bottle below it contained the main ingredients for new friends/reconciliation. I leave for a moment to come back with flame still going, no wax left, but a heart shaped glass piece blew out from the holder. The holder had a crack ring around it and a heart shaped (though jagged) hole. So many thoughts on what this could be - any help is appreciated! Welcome to the forum. please read this thread on reading candles for divination. Miss Anthena, I think that's might what happend. Because this is the same name of the girl he recently started a new relationship with. On the female candle, there were lots of dripping that I read means there will be "tears before there was a reunion", they weren't kidding around. I was crushed when I saw that in my newsfeed, but I'm not going to give up just yet. Will try a couple different tactics before that happens. Hi: I am a new member and enthusiast to the community. I lit a 7 day vigil candle "Come to Me' on Tuesday the 18th, anointed with Come to Me, Attraction, and Money Drawing oil - intended to bring an intended person of desire closer and specifically have him more apt to join a trip I am taking in a week. I have lit 2 previously with no incidence, and have noticed small, but gradual, shift increased attention from him. So I continued on . . .
Last night, I awoke to the Come to Me Candle breaking in the top 1/3, with black soot and a red rim of wax around the top rim of the candle. The glass was broken neatly, as if it were on an invisible hinge. I don't know how to attach pictures here, but I hope that makes sense? Hello, holyguacamole, and welcome to the Lucky Mojo Forum! 1) Read the previous pages; your question or one much like it has been asked and answered many times. Broken glass is bad, bad, bad. 2) Go to the link provided for the Candle Divination web page from my free online book "Hoodoo in Theory and Practice"
4) No divinations are given here because this is a customer service area for our curio company and spiritual supply shop -- but you can hire a candle reader at the Association o Independent Readers and Rootworkers (AIRR), who will accept your photos and interpret them for you, for a small fee. AIRR is not an affiliate of our company, but all of the members are trusted colleagues of ours. While I was burning my petition today it cast a blue flame, pretty neat, and I think it’s a good sign. Please refer to Miss cat's post just above yours. She provided a link to the free page on candle divination, as well as a link to her wonderful book which will educate you on everything you need to know about candle magic. A blue flame can happen when the fire gets too hot and causes a flame. Paper or other organic items can cause a blue flame as well. I am not saying its not a good sign rather some other ideas to think about. When you burn a petition remember to spread the ashes when done! I own Miss Cats book on candle burning, among some other classics Lucky Mojo carries such has Henri Gamache, which I highly recommend. The Black Folder book also has candle burning tips and and other goodies you may enjoy to read and learn about. I had a dressed an prepared Lucky Mojo Mercury candle for communication with a former friend which burned out after a little more than 5 days. While burning it the flame was steady and burned very clean with some glitter stuck at the top. Once all the wax had burned except for a little in the edges the metal that holds the wick had some residue that lit up and flamed very high leaving a light layer of dark soot along the glass. I know that dark soot is a bad sign but wasn’t sure what to make of it when it only occurred at the very end of the burn like that. Here are some links that Lucky Mojo provides for candle reading, and you can also go to an AIRR worker and receive a reading on the wax. In general dark smoke on the candle would mean obstacles and the person is resisting the work. I would try a reconciliation on the friendship and a road opener then do this candle again. I’m fairly new to using honey jars, anyway last night I burned 3 candles on top of my honey jar( it’s a small sized jar), when I woke up the candle wax residue seemed to pool beneath and around the jar and it looked almost like it was in the shape of a lowercase n.. but then again it could be that it took the shape of the jar. My question is, is that lowercase n shape telling me no it’s not working or am I just reading to much into it? I have moved your query to the appropriate form: Candle Divination. Although there there are several accepted wax shapes to look for with designated meanings, signs can, and often times will, be very personal. No one can really answer that for you for certain. On the one hand, I'd say always trust your gut feeling and intuition. It will never steer you wrong. However if you are inexperienced with this type of work and are not particularly gifted in the area of divination or are not in tune with your intuition then it is possible that you are "reading too much into it" to use your term. Also, check out Miss Cat's book on Candle Magic. I think you'll find this greatly helpful. I lit a red 4 in altar candle inscribed with my desires. I dressed the candle with honey, oils, herbs, glitter and some of my last moon. I lit and prayed over it and when it was done it was a complete charred mess. This was a love working for a current lover things have fizzled a bit. Any theories or advice is appreciated. To answer your question, I'm not too certain about this without all the information. What do you mean by it was "charred mess"? Did the candle not burn all the way down or did it burn all the way down and the heat caused your holder or whatever the candle was on to blacken? If the latter is the case this is normal and I would not worry but if the former is true then I'm not sure. I would need a better visual of what you're saying to comment. The candle burned completely. I burned it in a jar top since it was such a small candle. It Created sort of a charred crust in the bottom of the jar. I wish I could attach a photo. Thank you so much for your response Keith. No problem at all. Listening to what you describe, it sounds more like a natural occurrence, but still I couldn't be quite sure. It's possible, and maybe even likely, that it's a result of the all of the spell ingredients you used burning. I've had this happen and things turned out fine. Sorry, I don't know how much more assistance I could be with this one without seeing it. If you are concerned about the outcome, you should do a reading or have one done. You can contact our affiliates at AIRR www.readersandrootworkers.org. Find a reader that resonates with you. Dressing a candle with all the items you mentioned can cause a messy burn. Dressing a candle with multiple items is called double or tripple dressing a candle. The more you add the more likely it will burn messy. IE take a candle carve it and dress it with oil ( dress 1), then dust it in powder (dress 2) then roll it in herbs ( dress 3), another way is to then roll it in wax and sprinkle herbs on it again ( dress 4). Some people use all or none of them or one at a time. Honey is a sweetener, the sugar content in honey will char when burned. Dried herbs will also char. Try burning a candle carved with intention and oil only and see the results. This burn may be messy due to the added items. You can also burn a candle ask for signs, then tip it over and drop the wax into a glass of water and read the signs in the wax for answers to your question. Best of luck! Crazy candle behavior I've never seen... I have an interview tomorrow and I lit a green candle and rolled it in Money Drawing herbs, with Good Luck and Special Oil #20. Wrote a petition paper, 5 spotted that with Money Drawing oil. Everything was going great, but some of the herbs got caught in the flame, and this sped up the candle wax melt, considerably. The flame flared up to about a foot, but never once did it leave the candle stick or dish underneath. The wax then dropped over to the left, creating a very thick rope of wax. Then the flame went back to normal and looks like it's preparing to close the burn normally. So I consulted "The Art of Hoodoo Candle Magic", and on page 58 it says this could be a good sign. I tried Lenormand, and got Fish + Birds + Letter, so I took that to mean "Good news, based on personal networking", which I've done considerably trying to get this job. THEN I tried Bibliomancy, and got a story in Chronicles where David summons some musicians to sign and dance around the Ark of the Covenant, so with all of these things together, I'm getting the sign that this is positive. I hope that this is how a typical candle setter might review the scene, any thoughts on what I could do better or how I went wrong? Is there a cheiromantic angle to address if the herbs catch on fire? It *feels* good to me. I have photos if anybody wants to review them, maybe other students have ideas. I've moved your post here to its appropriate forum. The same question was brought up yesterday here. It's happened to me before, a couple of times, and I'll echo what I told the last person. Herbs will catch fire and flare up. This is natural and not an indicator of bad signs or unsuccessful work. I personally like it when this happens. I get the sensation that the fire is burning the essence of the herb(s) into the ether to make my work more potent. I would take heed to your signs from your own divination work. I like your interpretation. Look directly above your post here for some more insightful information from one of our forum regulars, JayDee. Also, we do not allow photos to be posted on the forum, as they eat up bandwidth and interfere with pagination. Hi i lit a candle for my ex and i have 2 rolls that appeared on the top and bottom of the candle. The wax has curved under. Would this be a good sign for my target ? Forgive me if what im about to ask is in the wrong thread (this is only my second post i have ever made). I had a falling out with the man i was in a casual relationship with, the falling happened because i reacted out of anger due to 'miscommunication' between us. I am at that age where I really dont want to have bad blood between anybody, so i really want to reconcile and salvage any friendship we might have left. I have had readings in the past where he came up, romantically he is unavailable as he isnt looking to commit, so i dont really want to start anything again romantically, but a friendship didnt seem to be out of the question in the reading. I burned a white skull candle with reconciliation oil and influence oil, adding balm of gilead and lavender to soften his anger towards me over what i did, and deer's tongue to make him want to reach out. I asked for him to think of me with less anger towards me, and for him to also realise the part he played in the demise of our 'relationship', and to make him want to reach out to me to make ammends because of this. I realise my petition could have been simpler, but it felt right for me to ask for all these things in one spell as i felt it all connects. about an hour and a half into burning the candle the eye socket of the right hand side of the candle melted through, and the wax trickled down like 'teardrops'. In the context of my spell i assumed this to be a good sign as i read it to mean that he feels remorse for the way he handled things (either that or one of us, so far it has been me, will cry). The rest of the candle wax burned really well, obviously there was alot of wax flowing but both the back of the skull and sides burned down relatively low with only the very bottom part of the candle remaining, so im feeling really positive about the results. The mouth/teeth area didnt burn down before the wick fell into the wax and went out, which i interpreted as him resisting wanting to contact me. I then 'doctored' the candle so to speak and manipulated the wick, added van van oil on the mouth (i didnt realise i had ran out of blockbuster oil!!!) relit it, and the mouth area burned down successfully, removing the blockage or so i hope. again i saw this as a positive sign, because shortly after melting down this block, the wick fell back into the wax. I attempted to relight the wick twice but it fell back in within seconds on both attempts, i took this as a sign from the spirits that this spell is DONE. my question is - because the mouth area of the skull was melted down because i had manipulated it rather than it melting naturally, would my desired result of him wanting to reach out to me on his own accord manifest? or would i need to repeat the spell (in a few weeks/month if i see no movement) and let it burn down naturally if thats what is intended? so sorry if it sounds like im doubting myself, i just want to make sure for future spells if what i did was acceptable. Thank you in advance for your guidance! Okay, having dealt with that technical trick, let me tell you that you cannot have it both ways: Either you use the candle for divination purposes or you manipulate the candle as a piece of altar or spell work, much like manipulating a doll-baby. You can start with divination and change over to manipulation if you don't like the signs you are seeing in the wax -- which is exactly what you did -- but once you touch the candle and switch into manipulation mode, you cannot legitimately claim a wax divination, since it was your work, and not a "reading" on the wax, that produced the final visual result. Either way is "correct" and both ways are "acceptable." This is topic covered more fully in my book, "The Art of Hoodoo Candle Magic," and note the name ART in that title, for i have come to believe and to teach that candle spells -- especially when performed with figural candles -- bring to bear similar techniques of the mind and spirit that are engaged when creating spiritually nuanced song, dance, sculpture, or drawings. Thank you so much catherineyronwode, that's incredibly helpful! I did an uncrossing spell then a road opener for someone else for love and a road opener for myself for a job. Both road opener candles have 50% dark soot on the the top half of candle and the rest is clear. Candle flame was strong for both. I have not lit the new love and job candles yet to draw them in because the road openers are just about to finish. Should I repeat the road openers again or be doing a blockbuster then road opener after cleaning everything? When I see that amount of soot, it tells me there are obstacles so a Block Buster candle would be a good idea, then follow with another Road Opener. That would be a good plan. Just to clear up I should light blockbuster candles after the road openers end, then do the road openers again followed by the love and job drawing candles? If the blockbuster candles also burn 50% black do I repeat the blockbusters until clear then relight the road openers?